As you have read, all 11 players made a significant contribution in this tournament. Several players played multiple positions, making plays and everyone made a contribution at the plate. Lane O'Dea had 9 hits including three homers, got a win on the mound and caught two games while Rob was gone. Jordan Pearce had nine hits and two homers, getting a win and also pitching five innings to keep us in the game Lane won...oh yeah...his walk off double sent us to the semi-finals! CJ Watson had six hits and 6 RBI including his 2 homer game against the Black Widows. Jaylon King had nine hits, saved game one and pitched four excellent innings in our final game. Tristan Sizik had four hits and played a big part in both late inning comebacks. Thomas Zlatic had five hits and scored the winning run against the Shockers. Dylan Robertson had five hits, one win and an important hold against the Shockers. Tyler Delatorre had five hits, one win and that winning hit to beat the Shockers. Rob Simsiman, in spite of missing the better part of two games had three hits, one three inning save against the Warriors and caught excellent games behind the plate. Yassin Wahhab had three hits, four RBI, great defense at 2nd and a two game streak where he was on base every time. Matt Myron played great defense in left, making catch after catch to stop big innings (including four putouts alone in the last game) and got a key RBI single against the Warriors. Thanks to all the coaches and parents who drove out to support us. It was a great wrap up to our 10 year old year, and we now look forward to beginning the 11 year old year next week as we start USSSA Fall League play. After two wild wins on Saturday, the Swarm bats cooled and the Bangers Baseball Club defeated the Swarm 6-4 on Sunday in the semi-finals, one game shy of the 10U Championships. Bangers 6, Swarm 4-Jaylon King started and went four innings, striking out four and surrendering only four hits. One of those hits was a homer that put the Swarm down 4-1. Jordan came right back with his second homer of the tournament to make it 4-2, and an unearned run made it 4-3 after four innings. The Bangers got one in the fifth off Dylan, but he struck out the side to end the rally. Lane got the run back with his third homer of the tournament in the 5th to make it 5-4, but the 6th inning magic wasn't there today and the Swarm went down in the 6th, unable to tie it. After the game, the Swarm all received third place medals and congratulations from the Triple Crown Tournament Director, who proclaimed the Swarm a real contender for national titles from here on out. It was a great ride, and these boys competed run for run against some of the top teams in a national tournament. We took pictures and headed home wishing for that last game, but very proud of the team. The Swarm advanced to the semi-finals in Henderson Saturday after rallying back twice in their final at bat to defeat the Hawaii Shockers 11-10 and the Santa Rosa Valleycats 8-7. The victories assure the Swarm a top four finish in the 33 team field. The Swarm's next game is at 11:00 against Bangers Baseball(UT). With a victory,the Swarm will advance to the D1 Finals at 1:00PM at Arroyo Grande Complex. Swarm 11, Shockers 10-The Swarm gave up 6 1st inning runs, but came back with five of their own to make it 6-5. Both teams scored 3 in the second to make it 9-8. Dylan Robertson came in to slow down the Shockers with two scoreless innings, and the Swarm tied it in the fourth on a Jordan Pearce RBI double. After a lead off double in the 5th, Jordan Pearce came in to strike out 2 and hold the Shockers to that one run, and the Swarm came to the plate in the last of the 5th down 10-9. With one out, Tristan Sizik and Thomas Zlatic hit back to back singles to put runners on second and third. Dylan followed with a first pitch single to right center, scoring Tristan to tie the game and sending Thomas to third. Dylan stole second to put two runners in scoring position. Tyler Delatorre came through, hitting a two strike pitch out in front of the plate far enough for Thomas to race in with the winning run. Jordan got the win, and we had ten minutes before the next game against the Valleycats. Thomas led the way at the plate with 3 hits, and Lane O'Dea, Jordan, Dylan and Tyler each had two. Jordan also hit the first of his two tournament homers in the first. Matt Myron added an RBI single for the offense. Swarm 8, Valleycats 7-Jordan started game two and gave up one in the 1st, but Lane O'Dea got it right back with a booming lead off home run to make it 1-1. The Swarm went ahead 4-2 in the 3rd on RBI singles by Thomas and Jaylon King. Jordan went 5 innings, striking out three, and left with a 5-4 lead. The Valleycats tied it in the 6th with an unearned run and held the Swarm scoreless to send it to extra innings. Lane came in and struck out 2, but the Shockers scored two, and led 7-5. With Tyler on second, Tristan singled him to third with no outs. Two outs later, Lane O'Dea singled to left, scoring Tyler to make it 7-6. With runners at 1st and 3rd, Jordan ended it with a bases clearing two run double to the fence in center, bringing home Tristan and Lane. Lane got the win, and the team mobbed Jordan in the infield. Lane, Jordan, and Tristan each had two hits to lead the Swarm. Rob Simsiman came off the plane from SD to get a pinch single as well. Now we're ready for the semi-final game against Bangers Baseball of Utah on Sunday. 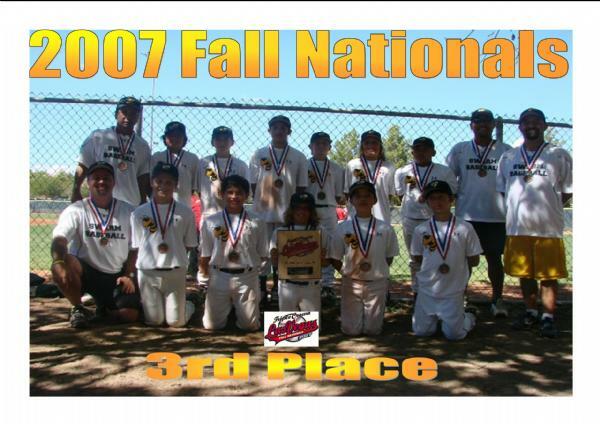 The San Diego Swarm earned the 2nd seed in the Fall National Tournament in Henderson, NV on Friday. Today's Championship Round Game will be played at 3:30 p.m. against the Hawaii Shockers. If the Swarm win, they come back and play at 5:30 in the round of eight. The Swarm came out swinging today and swept their two pool play games leading up to championship play, defeating the San Fernando Valley Black Widows 9-4 and the Las Vegas Warriors 15-6. The Swarm will know their pool seeding later tonight, so check back later to follow their schedule. Swarm 9, Black Widows 4-Dylan Robertson started and pitched 3 innings to get the win, and Jaylon King pitched the final three to get the save. The Swarm scored five in the first and never looked back. CJ Watson had a monster game, hitting two home runs and a single and driving in four runs. Jaylon and Jordan Pearce added two hit games. Swarm 15, Warriors 6- The Swarm pounded out 17 hits in defeating the hometown Warriors. Tyler Delatorre pitched three innings to get the win, and Rob Simsiman pitched three innings to get the save. Jaylon led the attack with a 4 for 4 day, followed by three hit days by Yassin Wahhab (Yassin got three RBI and made the defensive play of the game, earning the game ball) and Lane O'Dea, who led off the game with a homer to center. Rob and Tyler added two hits apiece. Matt Myron, Tristan Sizik and Thomas Zlatic played great defense and had productive at bats. The families of the Swarm began arriving in the Henderson and Las Vegas area tonight in anticipation of tomorrow's tournament opening doubleheader. Most of the team is staying at the Fiesta Casino in Henderson. We open up pool play at Anthem Park against the SFV Black Widows tomorrow at 9 AM. Our second game is scheduled for 11 AM against the Las Vegas Warriors. Keep watching this site for game reviews after 1 PM tomorrow. The Swarm came alive with 17 runs on 15 hits Friday night to defeat the Island Hoku Baseball Club 17-7 in the first game of what we hope to be a home and away series with our new found friends from Honolulu. The game was in hand early thanks to a 3 run, first inning homer by Jaylon King and a solo shot from Thomas Zlatic that staked the Swarm to a 5-1 lead. Jaylon pitched the 1st to get the win, followed by Tyler Delatorre, Dylan Robertson, Lane O'Dea, Jordan Pearce and DJ Lewis. The six held Hoku to 2 hits and recorded 11 K's, although they worked in and out of trouble by issuing 10 walks and 2 hit batters. The offense was paced by CJ Watson, who joined the Swarm line-up to get 3 hits. Thomas added a single to his homer for a 2 hit day. Lane, DJ and Dylan added 2 hits each, while Tyler, Matt Myron and Rob Simsiman added 1 hit each. After the game, the two teams exchanged gifts and the Swarm hosted a BBQ feast for all the families of both teams. Many friendships were made between the teams, and we look forward to staying in touch with Hoku and playing them in Hawaii next year. 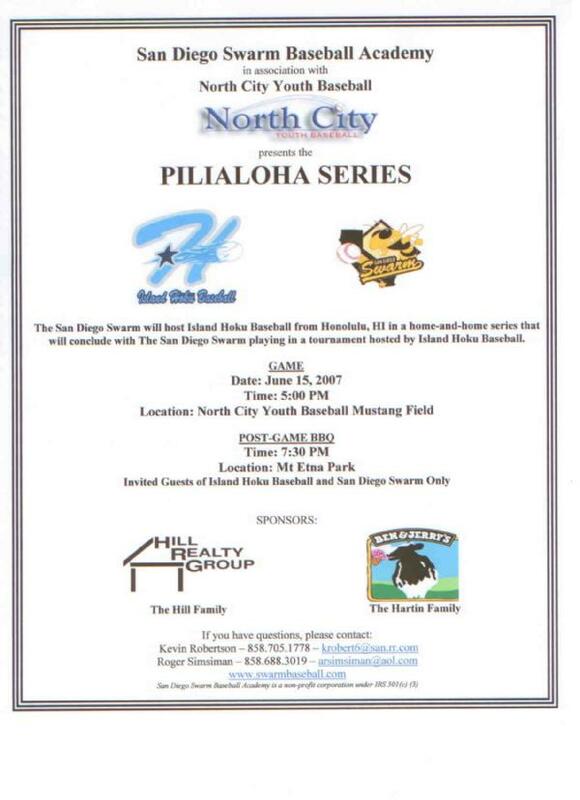 The Swarm are taking a two month break to compete for North City Youth Baseball in this year's PONY all-star tournament. Good luck to all the boys. After three great performances, the Swarm ran into a fired up Encinitas Reds team who took advantage of excellent pitching and shaky Swarm defense to post an 8-0 victory, giving the Swarm a second place finish in the 2nd annual North City Thanksgiving Classic. The Swarm were shut out for the first time ever, and were held to one Thomas Zlatic double by the Encinitas pitcher who struck out four and walked none. The Swarm's Jordan Pearce was unhittable for two innings, striking out five of the first seven hitters. The Swarm defense let him down in the third as six unearned runs crossed the plate to seal the game. This tournament marks the one year anniversary of the Swarm, and although we didn't come away with the championship, we have clearly improved in our year together. After finishing our 9 year old year with the D-2 championship in Steamboat Springs, the Swarm are 11-2 as 10 year olds. We have USSSA games the next two weeks before the Triple Crown Christmas Qualifier December 16-17. On behalf of the players and coaches, thank you for your attendance at our games and for support of the team. The San Diego Swarm defeated the Tecolote Heat 14-1 Sunday to advance to the championship game of the North City Thanksgiving Classic against the Encinitas Reds later today. Jaylon King pitched the first three innings to get the win, giving up one run, no hits, striking out 4 and walking five. Jaylon also drove in all the runs he would need with a long 3 run homer in the first inning. Rob Simsiman pitched two shutout innings to get the save. Offensively, the Swarm got back to business with 13 hits. Jordan Pearce, Thomas Zlatic, Morgan Roman-Baumeister, and Yassin Wahhab each had two hits to pace the attack. Going into the finals, the Swarm have outscored their three opponents 32-2, and Dylan, Tyler, Jaylon and Rob have given up just six hits with 19 K's in 15 innings. The San Diego Swarm defeated La Jolla 9-1 today at the North City Thanksgiving Classic to advance to tomorrow's semi-final game. More terrific pitching led the way, as Tyler Delatorre gave up only one run and one hit, striking out nine and walking four to get the second straight complete game victory in the tournament. Tyler struck out 2 batters in four separate innings. The Swarm started slowly, but banged out 10 hits. Morgan Roman-Baumeister, Jordan Pearce, Tristan Sizik and Yassin Wahhab each got two hits to pace the attack. Morgan has two hits in both games and Jordan has yet to be retired in the tournament. In addition to Tristan's rally-starting two hit day, he turned a 9-3 hot rocket to halt a La Jolla rally. The Swarm play game three at 8:00AM tomorrow against either Tecolote or Paradise Hills. The San Diego Swarm opened Thanksgiving Tournament play with an impressive 9-0 victory over the Encinitas Reds at North City today. Dylan Robertson pitched a complete game, two hit shutout with 5 K's and only 1 walk to get the win. Dylan retired eleven of the first 13 batters he faced and was helped by a beautiful 8-2-5 doubleplay in the third inning when D.J. Lewis caught a fly ball and threw a strike to Tyler Delatorre at the plate who threw back to third to nail the runner. The Swarm's 7 hit attack was paced by Morgan Roman-Baumeister who got two hits. Jaylon King slammed a first inning double high off the wall in left for two RBI. Thomas Zlatic and Jordan Pearce reached base in each of their plate appearances with a combined 5 walks, a double, four runs scored and 5 stolen bases. The Swarm play again tomorrow in game 2 at 8:00AM against La Jolla.